Baby classes are a great way to get out and meet other mums - and your baby will love them too! Local Mums give their recommendations for good local classes here. Babies learn more in the first year of life than at any other time. Never again will there be such an extraordinary pace of development. They are totally attentive and absolutely fascinated by everything that they can see, hear, touch, taste and smell. Baby Sensory doesn’t waste a moment of this valuable time! Award winning�Baby Sensory�classes provide a myriad of colourful sensory experiences and new sensations. Imagine taking your baby on a jungle, water or space adventure, to a winter wonderland or to a world of light and magic? Mums and Dads also find out how to settle and soothe their baby, how to get them on their tummies, how to perform simple massage techniques and a whole lot more. There are also some wonderful games and activities which are fun to do together. Music therapy is another sensory delight that cannot be missed! Each activity is supported by useful learning and developmental information, so that parents know how to lead their baby’s learning forwards, and every week is different. Parents are provided with hundreds of simple ideas for activities that they can do with their babies at home. Baby signing for example, is a great way to develop speech and language, whereas movement activities can help with the development of sight and hand-eye co-ordination, so important for later reading and writing. 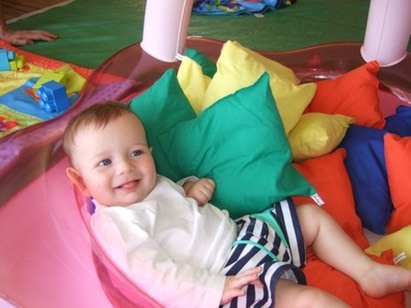 Baby Sensory�classes also provide an exploratory play area where parents can try out the equipment and developmental materials, interact with others and gain ideas for home use. And then it’s back to the sensory area for more activities, music and dancing that always ends with cuddles and big yawns from the babies. Not even a busy little baby can fight off sleep after so much activity! Baby Sensory�is recognized by health professionals and approved by the Royal College of Obstetricians and Gynaecologists to be an invaluable extension of post-natal care. To book a FREE taster class contact Theo at:�sutton@babysensory.co.uk�or call/text 07912 518905. There is also a Facebook page for updates:�http://www.facebook.com/babysensorysutton.